 Six simple steps for reading tarot cards using your psychic perception. 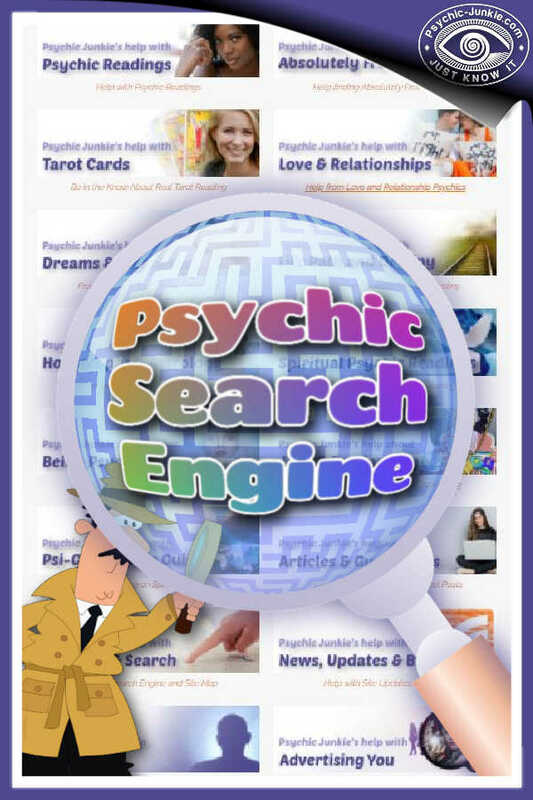 Step 1 of developing a psychic ability for reading tarot cards is to look for a fully illustrated Tarot Deck. That means having scene for each of the minor arcana as well as the major arcana. The Rider Waite was the first of the fully illustrated tarot decks and most of today’s illustrated tarot decks are now based in part on the Rider Waite deck. 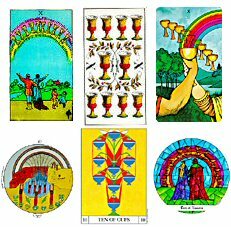 In the image on the right are six versions of the Minor Arcana’s Ten of Cups. Rider Waite – Swiss – Morgan Greer. Earlier decks, like the Swiss and Gareth Knight shown here, were more like traditional playing cards with pips and rods rather than scenery for the minor arcana. Reading those older 'playing card' type of decks is more aligned to Cartomancy. 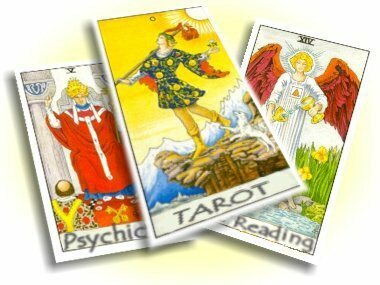 Step 2 of developing your psychic ability for reading tarot cards is to find a Tarot Deck you FEEL for. Look at the imagery of the cards; do the pictures speak to you? Do you feel inspired by the cards? Are you drawn in by the pictures? Does your mind start making up stories just by looking at different aspects of the cards? If you don’t have the feeling that there is a mystery waiting to be discovered within these cards just put that tarot deck back on the shelf and look for another. When you find a deck of cards that will make the psychic in you sing, buy them. 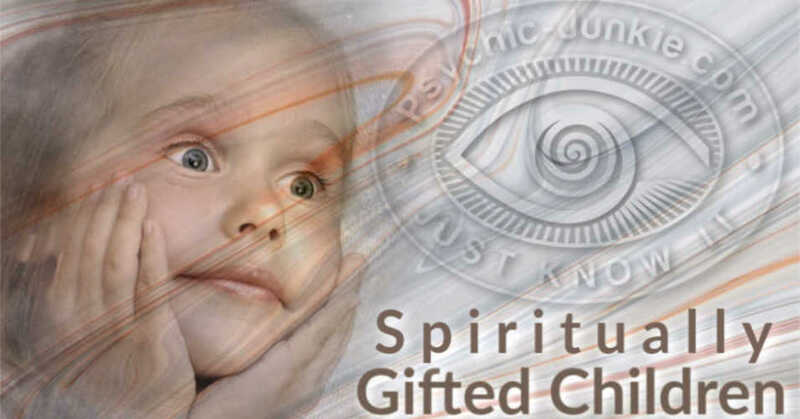 Now you can move to step 3 of developing psychic ability with tarot cards. Step 3 is to throw the book of instructions and meanings away. OK, just discard them for the moment if you want to hold on to all the details as a safety blanket. There’s nothing wrong with a study of the Tarot and using the Tarot as an oracle.  But I’m talking about using Psychic Ability as a way of reading your tarot cards, which is a different world altogether, so put the books and meanings and spread layouts out of the way for now. Step 5 in developing your psychic ability for reading tarot cards is to just let your thoughts bubble up ideas, stories, or messages while gazing at the cards. Ask yourself a question, pick a card and listen to your first thoughts as you gaze at the card. If you find it a little restrictive asking yourself a question, have a friend sit calmly with you to ask you a simple question. It will not matter if it is you or your friend who shuffles the Tarot Deck and picks the card. Just look at the card and with the question in mind allow your thoughts to wander as if making up a little story inspired by the artwork of the card. Step 6 in developing your psychic ability for reading tarot cards is to just do more of step 5. Just keep practicing and you will amaze yourself and your friends. With trust and a calm belief you will develop confidence and accuracy. 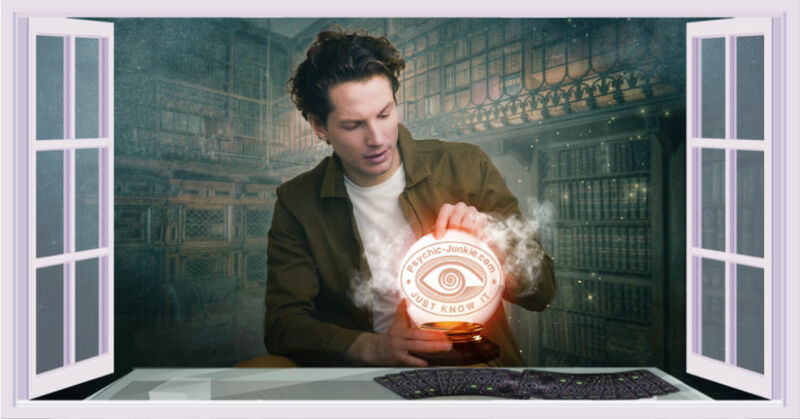 You will then find yourself psychically reading tarot cards by drawing three, or more cards at a time, even laying out ten or more cards and accurately receiving guidance and inspiration without the need for specific tarot spreads and without blocking up your psychic ability by stuffing your head full of other peoples meanings and interpretations. Just practice lowering brain waves in meditation while gazing at your tarot card images. Don’t be surprised when the characters in the cards seem to move and signal you for attention in your minds eye. With relaxed practice and trust in your imagination you will be reading the cards with Psychic TarotVision too! Here is a video for Reading Tarot Cards with TarotVision. If you want some more ways of learning to read tarot cards here is a great page with the meaning of each Tarot card laid out in sequence. Lots of definitions covering the Major and Minor Arcana are here.